P4K’s overarching goal for all our students is for them to graduate from high school and pursue some type of post-secondary education, and we are happy to report we are reaching our goal! An amazing 99% of our students graduate from high school and of those graduates, 90% are enrolling in college, trade school or the military and with the support of our partner programs and community supporters, the sky is the limit! Middle School-P4K begins preparing our students for college in middle school. Students attend college campus tours and Q&A sessions with current college students. 9th-10th Grade –Students can choose to participate in P4K’s High School Group Mentoring Program. This 2 year-long program meets 2-3 times per month at one of five locations, which include: Benson, Central, North, Northwest, and South High Schools. 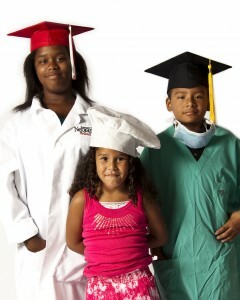 The focus areas of the program are 1) to prepare students to successfully transition into high school; 2) to help students prepare for life after high school through college/career exploration and mentor support; and 3) to connect each student with one of the P4K partner programs that best suits each student’s individual needs. Each student also meets with his or her P4K program coordinator regularly to develop an individualized plan for achieving academic and personal success. For more program details, click HERE. 11th-12th Grade-Beginning in 11th grade, students can decide to pursue a more intensive college preparatory or mentoring-based program with one of our 20+ partner organizations. Click HERE to view a complete list of our partner programs. P4K students who successfully complete the high school group mentoring program, participated in a P4K Partner Program, and meet the requirements of the P4K Scholarship Guidelines may be eligible to receive a scholarship for college or trade school. Questions? Contact Molly Verble, Post-Secondary Coordinator at mverble@p4k.org.